The ARIGO-system was developed in 1993 at the IBM research laboratory Rüschlikon in Switzerland by scientists like the Nobel Prize winner for physics, Dr. Georg Bednorz, and the former head of the department of nanotechnology, Prof. Dr. Bruno Reihl. 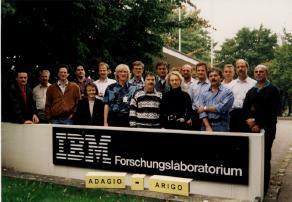 In 1996 ARIGO Software GmbH was founded as an outsourcing-company of IBM Germany GmbH by Prof. Dr. Reihl and Jörg Seiffert as manager. ARIGO Software GmbH became one of the leading companies in the area of LonWorks Powerline Technology, meter reading and Internet Connectivity. ARIGO developed and sold LonWorks energy, water and gas meter, HVAC controller, Light controller, M-Bus and N2 gateways. In 2001 Echelon acquired ARIGO and it became the Echelon European Development Center. EDC's focus was to develop Internet connectivity products for Streetlighting, Building Automation, Smart Metering NES (Echelon's Networked Energy Services) and Energy Management. In 2013 EDC's mission became to help other companies to adopt the LonWorks technology as Echelon Solutions Partner within an outsourced profit center, ARIGO Software GmbH. Jörg Seiffert and many key developers and experts are part of this new organization. Since 2016 ARIGO offers the FieldServer product line as an Authorized Reseller and became the Support Center for European integrators and OEMs.